Who am I to talk about FPW or give a hoot? I am someone who can't wear a strapless gown or a short, SHORT dress (though I dream about it, hehe) but that does not mean I dont appreciate the beauty or design of the creation or seek adaptability in my own lifestyle. This is what I planned and wore for the Night. Must say you can never fo wrong with Black and Gold on a short notice! I am wearing a plain Silk Jumpsuit by Maria Rao. Yes she is my sister, LUCKY ME but she honestly is good too and her work speaks for herself. The Clutch is not branded (no shame there, I Love it and I got for a shockingly low price!). The show was choreographed by Catwalk Event Management and production, backstage management was done by Production and PR being undertaken by Lotus PR and HUM TV was the official Media Partner...and the show begins . . .
Day 2 was opened by the renowned Shamaeel Ansari. with 27 years of experience and now holding position of one of the Chairperson in FPC (Fashion Pakistan Council). She showcased a collection inspired by the Japanese art of texture and print - Extra Orient. Hello?! Japanese? How could I NOT drool! Her work was reminicent of my favorite designer Akira Isogawa. 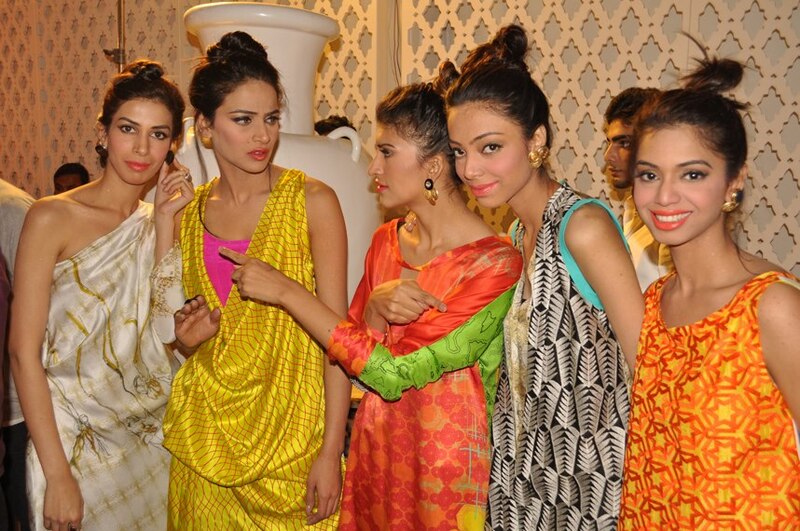 Printed, Contemporary, kimono-like tunics and flowy dresses in mainly pastels, muted greys, browns and a bit of rust. The prints were like a Japanese landscape paintings brought to life. What really impressed me was that she not only used inspiration from arts and culture but even techniques. She incorporated the traditional Japanese Shibori dyeing in her clothes (or atleast thats what it looked like to me). A bit of embroidery on print enhanced the design and cuts. Overall the collection was a walk in a Japanese cherry blossom garden for me. Styling of the show was done by Ehtesham Ansari who did a great job compared to most of the collections showcased in today's show. Next up were designer duo Arsalan and Yahseer. There collection was inspired by Northern Pakistan and Kashmiri culture and tradition and a lot of tapestry and kashidakari was seen BUT the only thing which was the most apparent was the overwhelming white. All white for the fashion conscious urban male? I know a lot of fashion conscious Urban Male (in a good way please, no overthinking!) and I think with an already small market the all white attire is adorned by even fewer men? Literally. Individual pieces worn with complimenting shades would look better, if not white washed. Anyhow there is nothing that stood out and caught my eye so I will pass. Overall fine. Her hip collection, Rock n Roll, was 'supposed' to be inspired by the 60s but even though the colors and patterns were a mix of retro, checkered, tie n dye and stripes the dominating cuts and styling was very 80s. Overall collection was fun, bold at times and the use of sequins to create checkered patterns was a nice touch and appreciated. Overall it was great styling and the choice of music, old pakistani happy songs, was a great compliment to the looks and NOT to forget the use of globally trending statement glasses was awesome. A brand known for their prints or as they say "Magical Prints" came next. Mostly neons and pastels with some monotones in the beginning. The collection was good. Nothing edgy or different. I liked how they used neons and fused it with eastern wear and got away with it while still making it look classy. The cuts were inspired by the 60s. Its an ideal brand, like always, for the professional YET fun women like me. I am going to go check out there store soon. Styling was clean and simple though I kept wondering if they were thinking "My fair lady" or "Breakfast at Tiffany's"? I suppose both if it took place in the 60s? 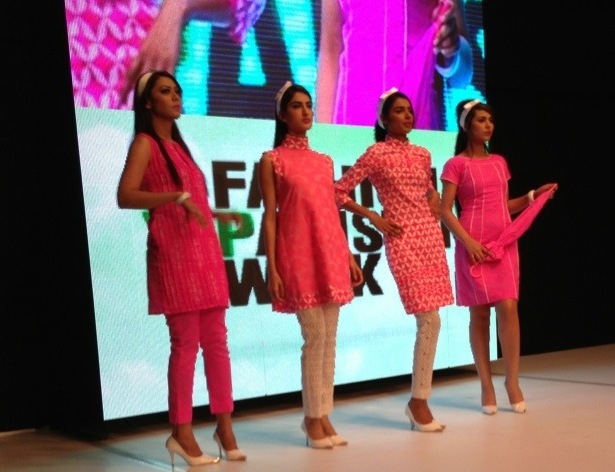 Use of cotton, lace and chiffon in pastel shades. Clothes for both men and women. A sprinkle of embroidery here and there, inspiration being Turkish. Crotchet in some outfits was a nice touch. Lots of yummy mint, olive greens and blues....cropped pants for men . . .Madiha Iftikhar in all white embroidered saree being the showstopper. Sadly the saree was not worn properly otherwise elegance could have been witnessed. Almost a miss, Obaid Sheikh I will check your stuff more if it makes my heart skip a beat which didn't happen here. 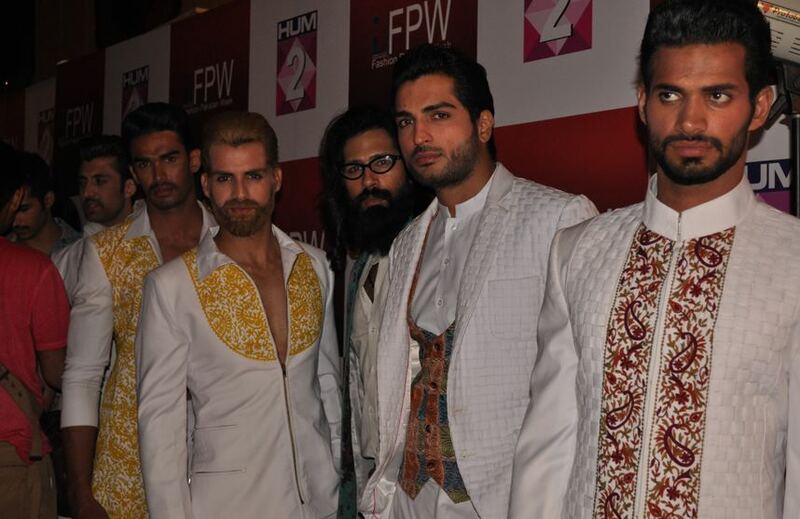 If I put it simply, Rizwanullah's collection was what I expected: Crazy, edgy and different. This designer knows how to create a stir every time. On purpose or by default, its a hit. The graffiti-like sketchy prints, mixed with layers as well as structured cuts are a sweet fusion of grunge meets modern art. 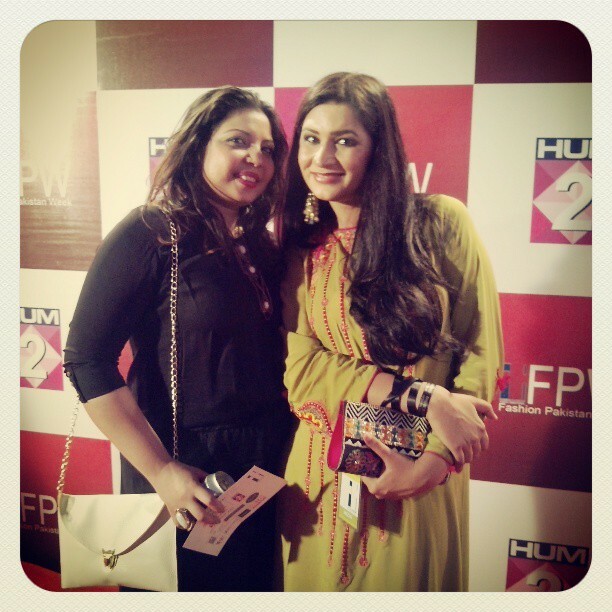 The punked up Jumpsuit worn by Fauzia was one of my favorites in the lot. Some plain black dresses in between were unnecessary as the rest of the work was very powerful on its own. Balgarian inspiration, colorful western, traditional embroidery...as the collection hit the ramp all I could think of was if Splash and Gulabo had a baby, this is it! The collection was fun, with in-your-face neons. It was for both men and women but what I liked here was that while the women's wear was bold and oozing with neons, the men's wear was more subdued shades which were fun yet wearable. I loved the funked up embroidered jacket worn by Ayan and the emboidered blue tie. The collection was a vibrant treat. Naqsh by Sania closed show1 before the break. Bright geometric prints and bold colors spewed onto the catwalk. I enjoyed the juxtaposition of different colors and prints. You could see vintage inspiration through maps and stamps being used in the prints but patterns being the dominant element. Colorful print on print was yummy along with graphic monotone prints with a bit of colored essence was a nice diversion from monotony.The collection was not bad at all but I was a little surprised with the styling. Such great potential for creative styling yet sadly we saw none. Show1 came to an end with Shamaeel Ansari presenting the Diamond award to Maheen Khan for her endless contribution to the fashion industry. We went out for a small breather and stretched our legs a bit with an occasional exchange of "hello" here and there. And here is where I will take a break as well :) Will follow with Day2 - Show2 tomorrow. 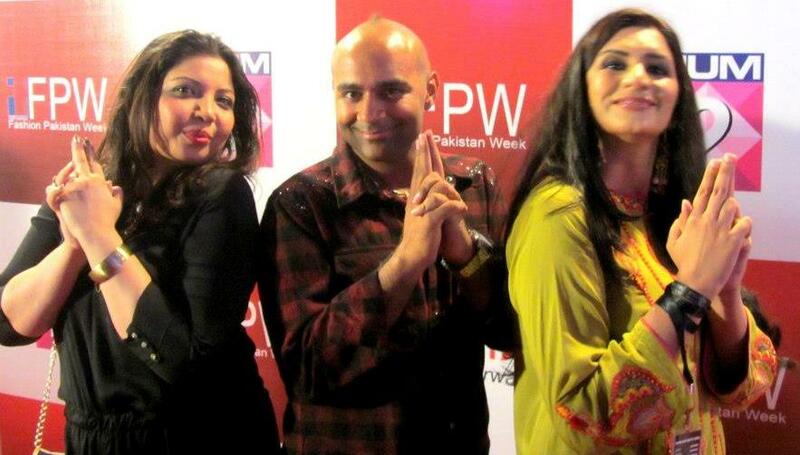 P.s: Photo courtesy by my dear friend Kashif Rashid, Simra Khan and Ebuzz. Incase you are interested in buying any of it or want to see more of the collection you can visit Labels. Good post! Both the models and you looked A-okay!